Great blog, Nicole. 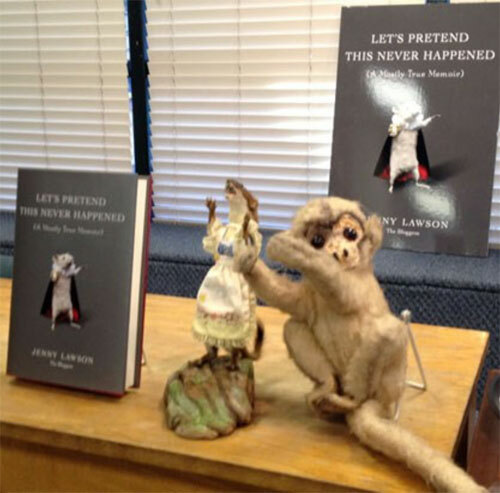 I am a fan of yours, and now a fan of Jenny Lawson. Thanks so much for the entertaining heads up. Thank you, Jean. I am looking forward to your upcoming audio story. Apologies for my son’s watchcap hogging the frame. It was either feature the hat or box him in the ear with my iPhone. After much deliberation, I opted for the former. Hah! If you’d asked me, I would have said box him in the ear. Just kidding. He’s a good kid, just a little dopey (which, come to think of it, may be where he got the idea for the hat). P.S. It’s a fashion thing that’s popular among some of his peers regardless of the weather. Bell bottoms and leather fringe ruled the day when I was his age. I teach high school. If only it were just watch caps! My generation was blessed with acid wash jeans, shoulder pads and big hair. Ray-Ban Wayfarers were our saving grace.